Discussions are organized first by Categories, then by Topics, and then by Thread. 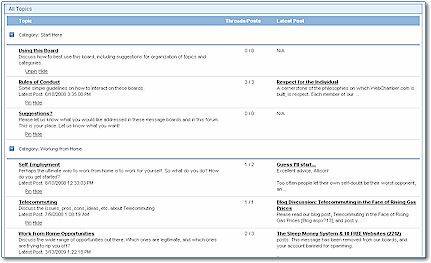 This structured organization allows users to quickly browse the discussions to find topics of interest without having to scroll through endless posts that don't interest them. Users can keep up to date on the latest discussion posts through a variety of subscription options. They can choose to receive email notifications every time someone makes a new post anywhere on the board, or they can choose to receive daily digests of all new posts each day. They can also choose to be notified of new posts as they are applied to individual topics or individual threads. This way, users can keep tabs on topics of interest at whatever granularity they choose. 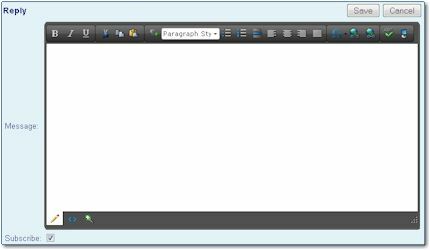 When posting to a thread, users are able to utilized a rich text editing window that gives them WYSIWYG (what-you-see-is-what-you-get) editing capabilities. Each site can choose just how much or how little functionality is available to users to address the balance between user needs and system security. User's signature lines are automatically appended to their posts. When users receive email notifications of new posts, they can simply reply to the post via email. The Communities OnTheWeb system is smart enough to recognize both the user and the thread they are replying to. If desired, you can also enable specific email addresses to allow users to initiate new threads directly from email.